What little colour I could find above the Dyfi Valley. After what seems like an eternity most of us are enjoying some warm sunny days. Living up in the hills as I do it is several years since I’ve been able to wear shorts and a tee shirt all day long for several days in a row. And I’m finally getting some serious wear out of the flipflops I rashly bought one September several years ago……. But for the landscape photographer these conditions are the pretty close to the bottom of the barrel. Wall-to-wall sunshine with barely a cloud in the sky do not a happy photographer make, especially in mid-summer. Sunrise is so horribly early that an enormous effort is required to get up in time and without cloud disappointment is often the result. This week the sunsets have hardly been any more interesting and the disturbed sleeping patterns don’t help either. The predominant colour – often the only colour – in the landscape is mid-green. I’ve recently been commissioned to provide some images for a footpath promotion project in the Dyfi Valley, just north of Aberystwyth. 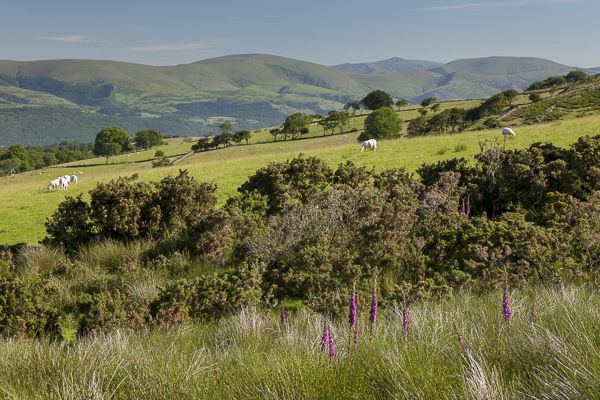 They aren’t the most spectacular locations but they are very pleasant mid-Wales landscapes. However one is normally judged on one’s best work, and that is often made at the right time of year and in the very best atmospheric conditions. Most photographs I produce during the next month will, I suspect, be disappointing for the client. My first efforts last Sunday morning made me realise that this wasn’t going to be an easy job at all. The best ‘views’ from just this one walk were in several different directions. They will need to be photographed at different times of day to make the most of the polariser which I usually use. And this uninterrupted sunshine really doesn’t help at all. Partial cloud cover acts as giant diffuser allowing gentle light to penetrate into the nooks and crannies that direct sunlight cannot reach. Without it the landscape looks harsh and uninteresting. But I love mid-August onwards, well into September. The landscape seems to come alive as wild grasses wither, bracken begins to turn golden and all sorts of other subtle changes take place. And if you visit the right parts of the country the senses can be assailed by the intense pinks and purples found in heather moorland. It almost seems like a different season, and in fact, according to the Chinese Five Element theory, there IS a fifth season, rather uninspiringly translated into English as ‘late summer’. Some of the other characteristics of the season include ‘earth’ as the relevant element, ‘afternoon’ as the time of day, and ‘spleen-pancreas and stomach’ the bodily organs. But maybe we don’t need to go there……. Back in the present, I’ve been able to pack a few postcard and calendar orders off to customers in the last couple of days, so some progress has been made. But it feels so desperately wrong as a photographer to be hoovering the office, spring-cleaning the van and making marmalade, while outside the sun is beating down. This entry was posted in Uncategorized and tagged Dyfi Valley, harsh sunlight, late summer, summer photography. Bookmark the permalink.